July 9th was the day of Dursley Festival and the sun shone! The day began with music and stalls in the town centre followed by a procession towards the recreation ground where events were held throughout the afternoon. Large crowds came along to enjoy the different activities which included demonstrations in the arena, music in the marquee and numerous clubs and a large number of local clubs and societies were present. The fire station also opened their doors for the public to view the modern facilities and inspect the engines and equipment. In the town it seems at long last that the planned restaurant in the old Coop building near the junction of Parsonage Street and May Lane is getting closer as signs have now gone up for "Reid's", which will offer Italian cuisine. Signs have gone up for "Reid's" a new Italian restaurant still to open its doors. It will be good to see this vacant premises filled at last. On Dursley Festival day, there was plenty of activity around the town centre and one musical group played to the crowds from under the Town Hall. Yet another group of musicians entertained passers-by in the centre of Parsonage Street. From 1pm the focus of activities was on the recreation ground and large crowds gathered to enjoy the arena events and the stalls. Dursley Male Voice Choir put on a fine show at the town festival, singing to a large crowd in the marquee. While the festival was on in Dursley town centre, the fire station opened its doors. This view was taken from the upper balcony and shows the view towards the new Rednock School all-weather pitch with one of the new engines in the foreground. The landscaping at the rear of Rednock School is now complete and has taken on a completely different appearance to just a few years ago. 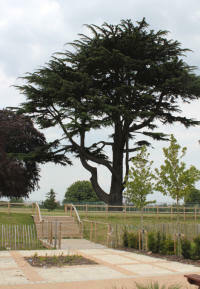 This view shows one of the large cedar trees which once stood outside Rednock House, home of Captain Graham. The house has long since been demolished but the tree survives.